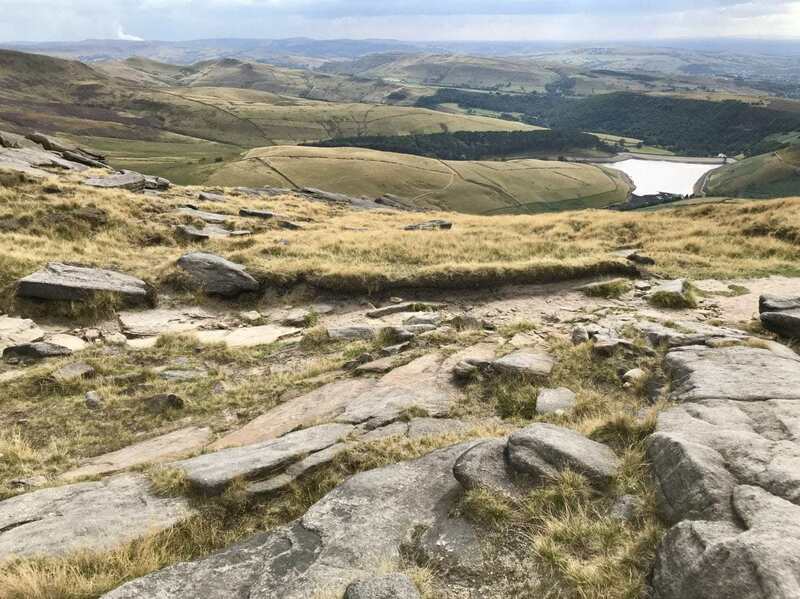 This walk takes you to the highest point in the Peak District, via some of the most spectacular scenery. Kinder Scout is a vast moorland plateau with views to Manchester and Staffordshire, and on clear days, as far as Snowdonia in Wales. 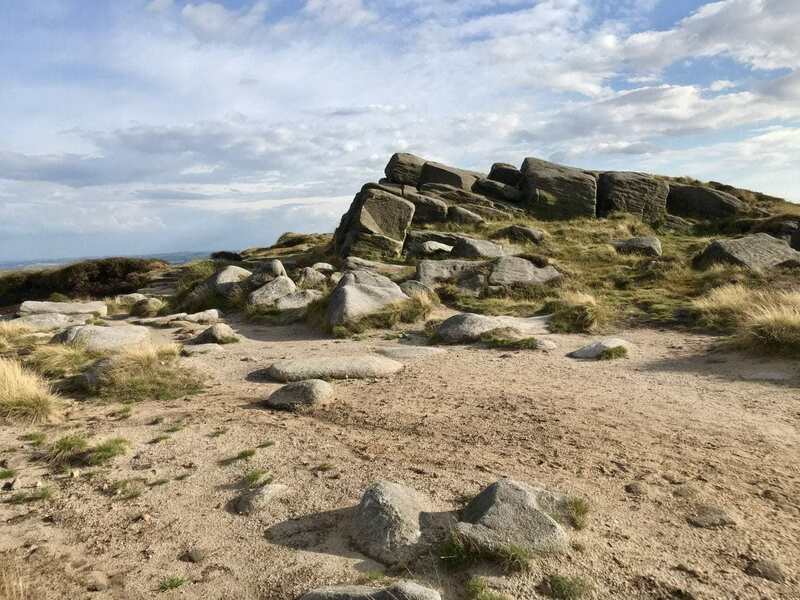 The route also takes you past Kinder Downfall, the highest waterfall in the Peak District, and through fascinating gritstone rock formations at Sandy Heys. 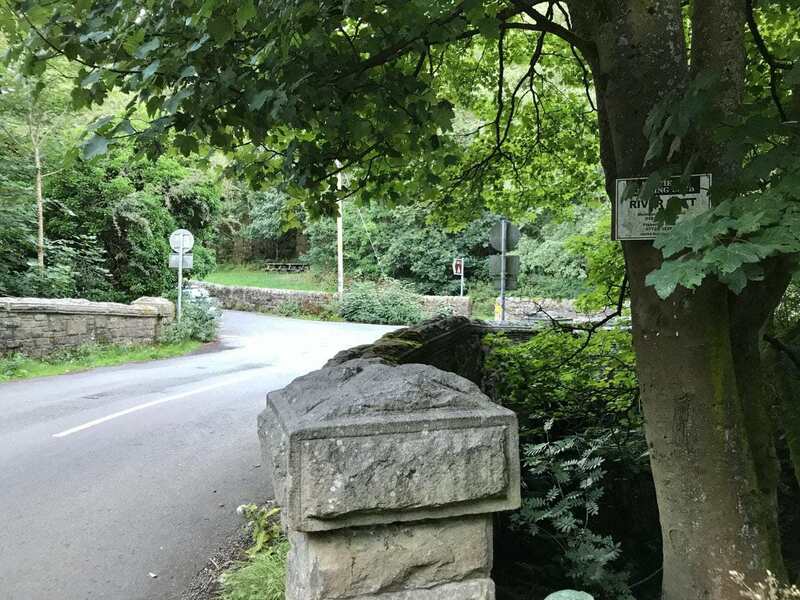 Street parking is free and the walk starts and ends in the very pretty village of Hayfield, which has plenty of refreshment opportunities for before and after the walk. This is a circular walk of just over 9 miles. The terrain is uneven and there are some steep uphill climbs, so it is perhaps best suited to experienced hikers. 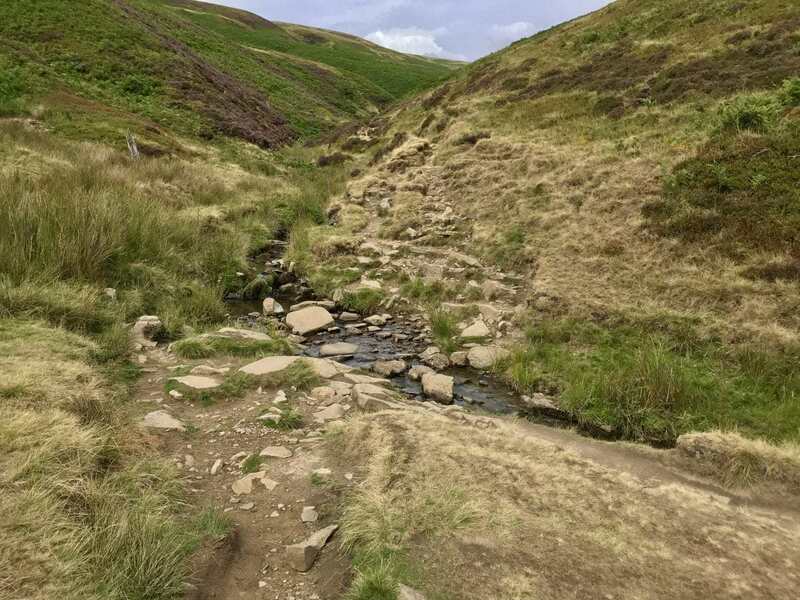 Please ensure that you take a map and compass, wear appropriate walking boots, and go prepared with enough clothing for sudden changes of weather! Give yourself 6-7 hours to complete this walk at a moderate pace, allowing for rest stops to take in the views. The walk starts in the village of Hayfield. 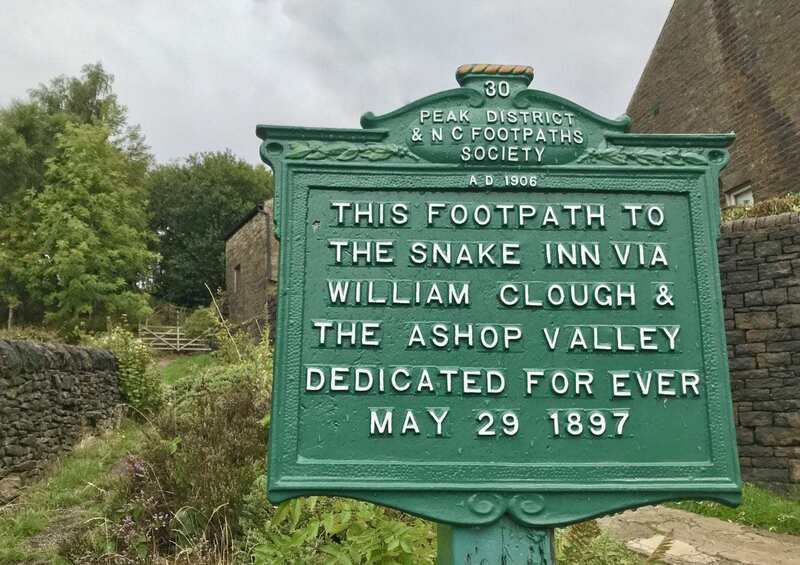 Park along Kinder Road, and take the Snake Path (SK 04073), which is signposted to the Snake Inn via William Clough and the Ashop Valley. Look out for the plaque on the wall at the start point, which commemorates the Kinder Mass Trespass on 24 April 1932. 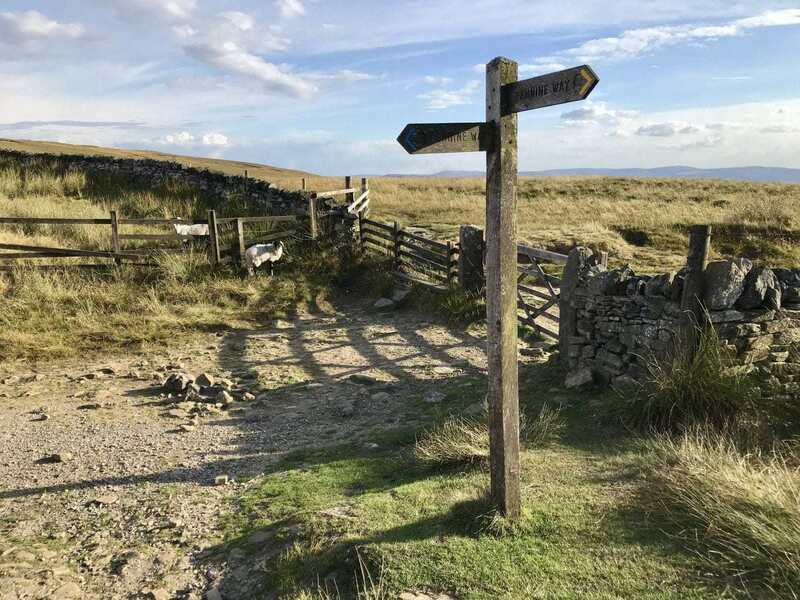 Follow the well-marked Snake Path up and out of Hayfield, proceeding across fields through a succession of kissing gates, past a group of trees known locally as Twenty Trees. The views back towards the village are spectacular. 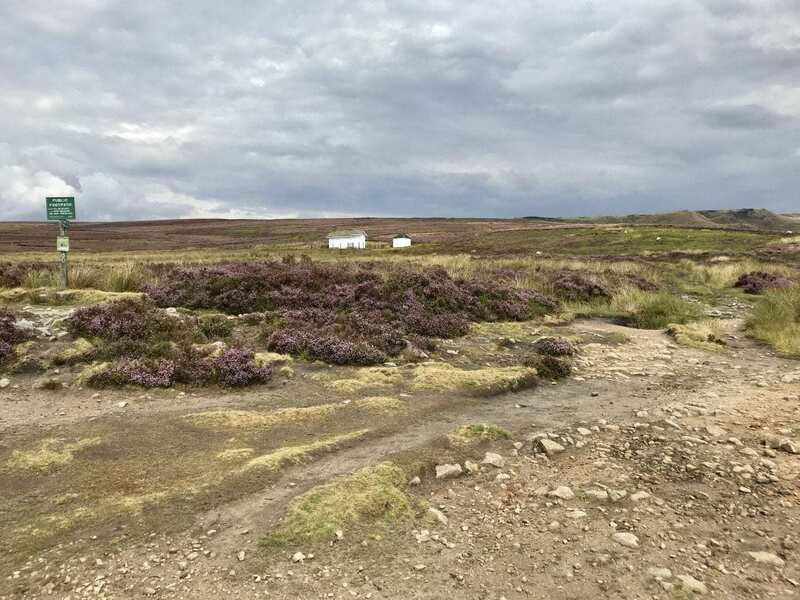 Upon reaching a five-barred gate, enter an expanse of heather moorland, signposted Snake Path. Ahead of you look out for the distinctive white shooting cabin visible over to your left. The path forks here, and you should take the path on the right, away from the cabin. Continue following the well-marked path, with views of Kinder Reservoir soon apparent ahead of you. From here you can see the vast, dramatic bulk of Kinder Scout above the Reservoir. You will soon come across a sign marked to Edale via Jacob’s Ladder, but do not take this path. Instead, continue on the path ahead, keeping the Reservoir to your right. Do not descend to the footbridge. You are now approaching William Clough, where you follow the course of a small brook uphill on to the heights of Kinder Scout. 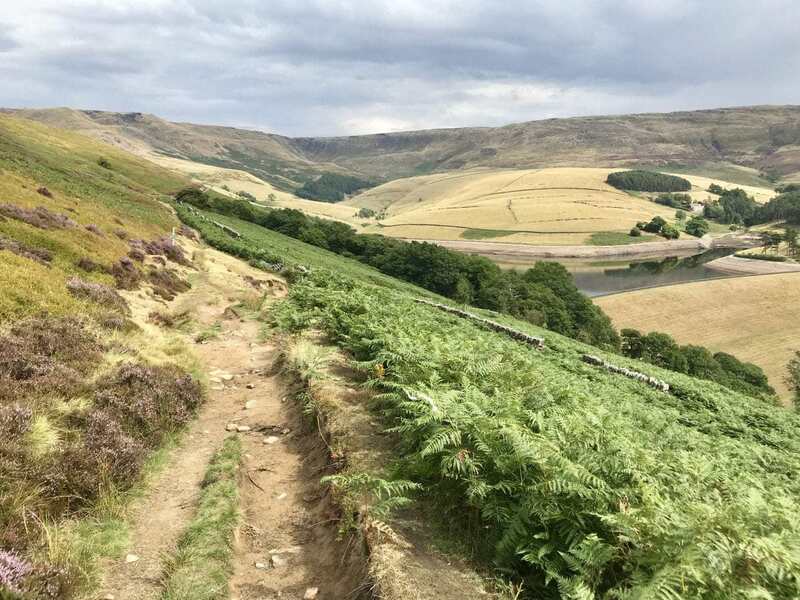 In summer months this is a tricky but beautiful scramble, but beware that in wet conditions or during winter parts of the path might be passable only with extreme care. On reaching the top of William Clough, maybe after a well-earned rest, take the right hand fork where the path divides, and continue on the paved path that is visible tracking uphill. 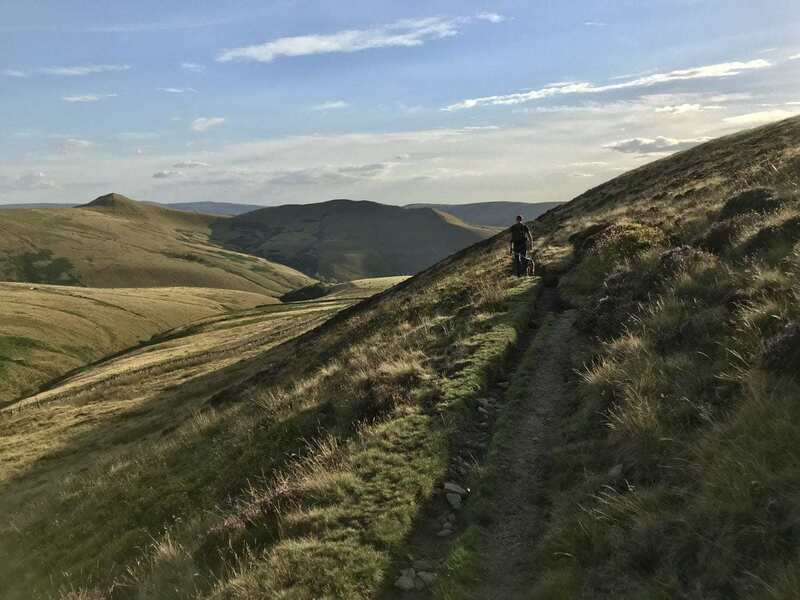 This is now part of the Pennine Way, the 267-mile trail that runs from Edale, through Yorkshire, Northumberland and up into Scotland. Take a while at the top here to admire the magnificent views. The path bears left and sticks quite close to the edge of the plateau. Ahead you will see the wonderful rock formations of Sandy Heys (SK 07500 89500), carved and created by wind and water over the millennia. Continue on through a gate and stick to the path as it veers right and on towards Kinder Downfall (SK 08500). This is the highest waterfall in the Peak District, where the River Kinder plummets almost 100 feet down to join the River Sett in the valley below. When in full flow, particularly when there is a strong westerly wind, the water blows back up the hillside and the resulting cloud of spray can be seen from miles away, although in summer it can be entirely dry. Continue on the path along the edge of the plateau. Where it forks, follow the cairns and take the left hand fork. Ahead of you, away to the left, you should soon be able to see the white trig point of Kinder Low (SK 07904), which is the inappropriately-named highest point in the Peak District at 633 metres above sea level. From the trig point, you should continue walking in roughly the same direction as you were, taking the broad path towards a collection of large gritstone boulders known as Edale Rocks (SK 07921). The path is clearly marked to the left of the rocks. From here you get a wonderful view over the Edale Valley and Mam Tor. Follow the well-marked path away downhill. At a very obvious fork, take the right hand path, away from Jacob’s Ladder. At the end of this path is a finger post for the Pennine Way, which you leave at this point. Go through the gate to the right of you and walk straight ahead of you keeping the wall to your right. Watch out for a pair of ancient stone gate posts, through which the path continues. Immediately after the posts, look to your right and find Edale Cross, a medieval cross carved from local gritstone and believed to date from the 12th Century. 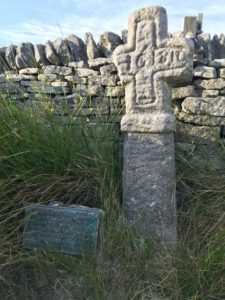 It was found buried in peat by local farmers, who carved their initials onto the front, along with the date 1810, and re-erected it in its current location. Continue downhill on this uneven path, until you reach a path leading up to a stile on your right. Over the stile there is a public footpath sign. Turn left and follow the well-marked path downhill back towards Hayfield. The prominent hills ahead of you are South Head and Mount Famine. At the bottom of this path there is a large ladder stile with a National Trust signpost for Kinderlow End. Continue on the well-marked path across a succession of fields and stiles, towards a small collection of farm buildings. At the elegant Tunstead House, follow the footpath as it bears right and down back into Hayfield. At a crossroads continue straight on, walking beside a stream on your right hand side. Follow the road as it bears right over a stone bridge, and then turn left towards the village. You are now back on Kinder Road, where you can relocate your car. The start point of the walk is approx. 500 metres ahead on the right hand side.